The Great Divide is a reoccurring feature here at MMA Fighting in which our own Shaun Al-Shatti and Chuck Mindenhall debate a topic in the world of MMA — whether it’s news, a fight, a crazy thing somebody did, a crazy thing somebody didn’t do, or some moral dilemma threatening the very foundation of the sport — and try to figure out a resolution. We’d love for you to join in the discussion in the comments below. 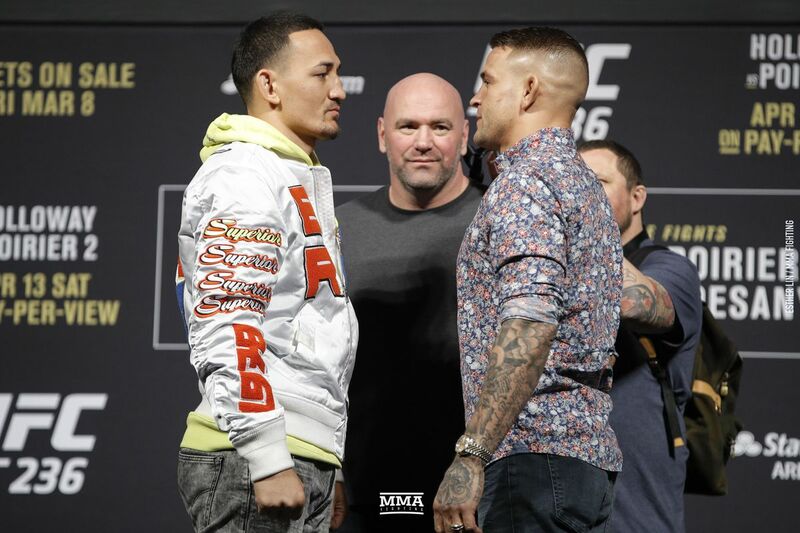 This week, our two scribes gaze ahead to next week’s journey into Atlanta and ponder the question: Dustin Poirier vs. Max Holloway or Kelvin Gastelum vs. Israel Adesanya, which of the two interim titles up for grabs at UFC 236 means more? Al-Shatti: I won’t lie, this is a bit of a surprising one for me, Chuck. If you would’ve posed this question to me five weeks ago, when Dustin Poirier vs. Max Holloway seemingly materialized out of thin air, I would’ve never believed anyone who said I’d be siding with this fight. I hated Poirier vs. Holloway when it was first announced. Hated it. Obviously the matchup itself was always a guaranteed banger, that wasn’t the issue. I more so hated what Poirier vs. Holloway represented. The lightweight division was already one great, big, colossal mess, and the notion of throwing Holloway into UFC 236 willy-nilly when a guy like Tony Ferguson was perpetually stuck in title limbo made my jimmies more than a little rustled. In my mind, not only did Poirier vs. Holloway make zero logistical sense, it blew up the entire framework of the best division in the sport. But it’s safe to say a lot has changed. With Ferguson now sidelined for the foreseeable future due to personal issues, Poirier vs. Holloway suddenly makes a whole heap of sense. UFC lightweight champion Khabib Nurmagomedov won’t be around until late 2019 because of his suspension, Conor McGregor is off somewhere in the void doing Conor McGregor things, and no one else in the 155-pound division can really claim to deserve the opportunity more than Holloway. I didn’t expect it to happen, and I’m honestly kind of shocked that it did, but I’ve come around in a big way on UFC 236. So that leads us back to our question: Which interim title fight means more? It’s a difficult question to nail down, just vague enough to where it could mean anything. I know we’re all sick of interim titles — believe me, I know — but both Poirier vs. Holloway and Gastelum vs. Adesanya feel like the rare instances where interim straps are not only justified, but legitimately needed in order to keep divisional trains chugging. So for me, the answer lies solely in what a win will actually mean for the major players at UFC 236. That’s why I lean towards Poirier vs. Holloway. Because while the new interim middleweight champion will likely be shuttled into a unification bout against a man who may be one of the toughest and most underrated S.O.B.’s in the entire UFC (Robert Whittaker), the new interim lightweight king will be hurled into a wholly unpredictable 155-pound title mix, which could lead to one — or both — of these outcomes: 1) A fight against Nurmagomedov, a big name who has never been more popular, and a champion with a reputation so imposing that whoever topples him from the ranks of the unbeaten will instantly go down in annals of MMA lore; 2) Or an obscenely lucrative dance date with McGregor himself. Either of those outcomes is a career-changer for a fighter on the brink of stardom like Poirier or Holloway. That’s not even mentioning the smaller legacy boosts up for grab at UFC 236. An already dominant champion like Holloway can join the rarefied air of two-division kings. An enteral underdog like Poirier can prove once and for all that he belongs in any discussion regarding the best lightweights of this era. There’s a surprising amount of meat on this bone, and all of it seems juicer to me than the simple chance to challenge Bobby Knuckles. That’s why, in my eyes, the lightweight belt will mean more next weekend — even if you have to caveat it with that dreaded “i” word. Mindenhall: Here are seven words I never thought I’d type, Shaun: Some interim titles mean more than others. Not that the UFC is trying to push-broom actual middleweight champion Robert Whittaker to the exits, but let’s face it — everyone is smitten with Israel Adesanya. We’re told, on fairly good authority, that he has that star quality that is so coveted in star-driven sport. He looks cool. He acts like a freaking movie star playing the role of a dapper-dressed assassin. And he styles on dudes in the Octagon, like he’s operating from an entirely different playing field. So of course Dana White is ready to start cashing in on the “The Last Stylebender,” and get all those critics claiming the UFC is running out of stars off his jock. The sooner the Ade$anya Era can begin, the better. This fight is meant to expedite things, and obviously set up the title fight with Whittaker whenever he’s ready to make his return. That unification bout would stand to become the biggest of Whittaker’s career, which tells us everything we need to know about Adesanya’s ability to convert non-selling champions into ridiculously deadly B-sides. Is that what they mean by “It factor?” I think it might be, Shaun. I think it might be. Now, if we’ve learned anything over the last handful of years it’s that Kelvin Gastelum — who is built like Juggernaut from He-Man — loves ruining people’s parties. He did it to Uriah Hall to close out that crazy season of TUF. He made Tim Kennedy’s swan song a tragically sad one, and that particular number felt like a summer pop tune compared to the music he sent Michael Bisping into the offing with. 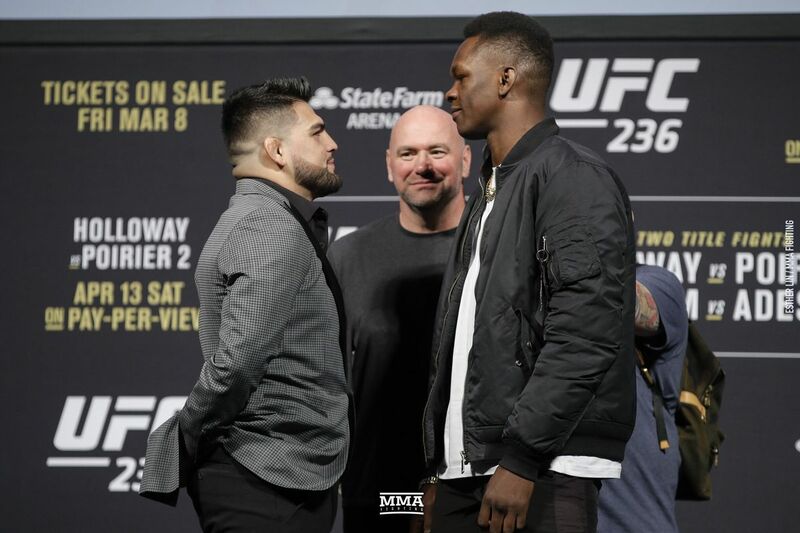 Nobody snatches souls as frequently and as quietly as Gastelum, who presents some challenges for Adesanya. He has power, and he has cunning. Gastelum won’t be a cakewalk. In fact, he’s the scariest kind of spoiler — a hydrant with a fade. If Gastelum wins? His stock rises, but there will be some angry stares for taking out the Next Golden Boy. All the more reason to showcase Adesanya’s prowess against such a dangerous customer. If he beats Gastelum like he did, say, Derek Brunson at UFC 230, I really believe it’s magic time. For the UFC to wrap a belt around Adesanya’s waist is to open up three solid markets of fanaticism. America loves a brash star like Adesanya, who already has a knack of making sportscasters swoon. You can have him fight anywhere in Australia and New Zealand as a champion, and he’d be colossal draw. And the UFC can break new ground in Africa, something its wanted to do for a long time, with special emphasis on Nigeria, where Adesanya was born. He’s already expressed interest in doing a tour of Africa with welterweight champion Kamaru Usman sometime in 2019. That belt, whether it’s the real thing or a placeholder, works as a symbol to a million kids in need of hope. If he’s the one wearing it, given how passionate he is as a fighter, that’s a whole different level of impact. Of course, I get ahead of myself. Max Holloway is a phoenix in the fight game, a guy who just blazes through life doing it his way — eating cupcakes, winning titles, clowning Irishmen, dubbing landlocked cities honorary islands, etc, etc, it is what it is. If he beats Dustin Poirier in the main event next Saturday night, that will be a big deal. Even though a few fighters have won simultaneous titles now, it’s still a rare feat. It would mean big, big things for Holloway to add the lightweight title to his collection and set up that ridiculous fight with Khabib Nurmagomedov. His cult of personality would reach an all-time high, and I’d love to see it. But for me, Adesanya realizing his potential in six fights — just 14 months after debuting in the UFC — has a transcendent quality to it, that not even the “Blessed” one can touch. He is the definition of a “game-changer,” and right now the game is ripe for a change. Which UFC 236 interim title will mean more?